-BMW M GmbH has sharpened the race-inspired character of its BMW M5 high-performance sedan with an even more powerful model. The new BMW M5 Competition (fuel consumption combined: 10.8 –10.7 l/100 km; CO2 emissions combined: 246 – 243 g/km)* sets new performance benchmarks in its segment. 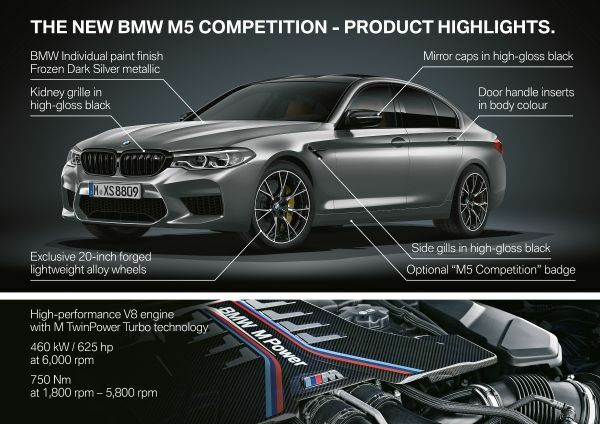 - The market launch of the new BMW M5 Competition creates a new product category. In future, BMW M GmbH will offer the most powerful variants of its high-performance cars as standalone models. This new status reflects the individual character of the BMW M5 Competition. 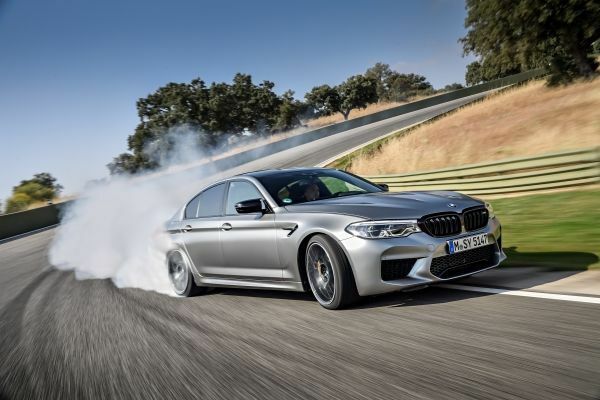 It also heralds the latest chapter in a history of success which began with the M Competition package (including power boost) configured specifically for the predecessor to the current BMW M5 – and which the exclusive new BMW M5 Competition builds on convincingly. * The fuel consumption, CO2 emissions, power consumption and operating range figures were determined according to the European Regulation (EC) 715/2007 in the version applicable. The figures refer to a vehicle with basic configuration in Germany and the range shown considers the different sizes of the selected wheels/tyres and the selected items of optional equipment. 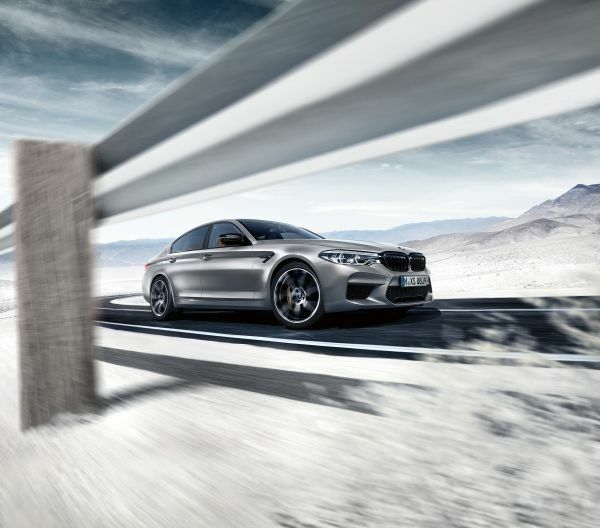 - The new BMW M5 Competition combines an ever-present sense of therace track and a suitably rarefied aura with the unruffled ease in everyday use for which BMW M models are renowned. A 19 kW/25 hp hike inengine output over the standard version of the new BMW M5 (to 460 kW/625 hp), even more direct responses and bespoke chassis tuning combine to maximise dynamics, agility and precision. - The 4.4-litre V8 engine with M TwinPower Turbo technology has been modified specifically for this new application and develops peak torque of 750 Nm (553 lb-ft) across an even broader rev range – from 1,800 rpm to 5,800 rpm. 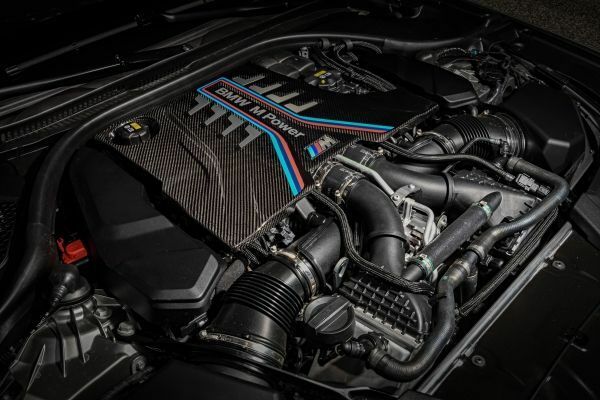 - The thrust generated by the new BMW M5 Competition’s engine enables acceleration of 0 to 100 km/h (62 mph) in 3.3 seconds and 0 to 200 km/h (124 mph) in 10.8 seconds. - Like the engine’s responses, the aural character of the standard-fitted M Sport exhaust system can be adjusted at the touch of a button. The driver can also use the M Sound control button to initiate an extremely discreet soundtrack. - Model-specific engine mounts with a higher spring rate provide a much firmer connection between the drive unit and vehicle structure in the new BMW M5 Competition. This has a noticeable effect on the car’s responses, the sharpness of its turn-in and the experience of the engine’s soundtrack inside the car. - The engine’s power is channelled to the road via an eight-speed M Steptronic transmission with Drivelogic. Added to which, the new BMW M5 Competition is specified with the M xDrive M-specific all-wheel-drive system and the Active M Differential at the rear axle. The centrally controlled interaction between the two systems optimises traction, agility and directional stability. - The M xDrive system’s rear-wheel bias provides the ideal basis for a fullblooded performance-driving experience. 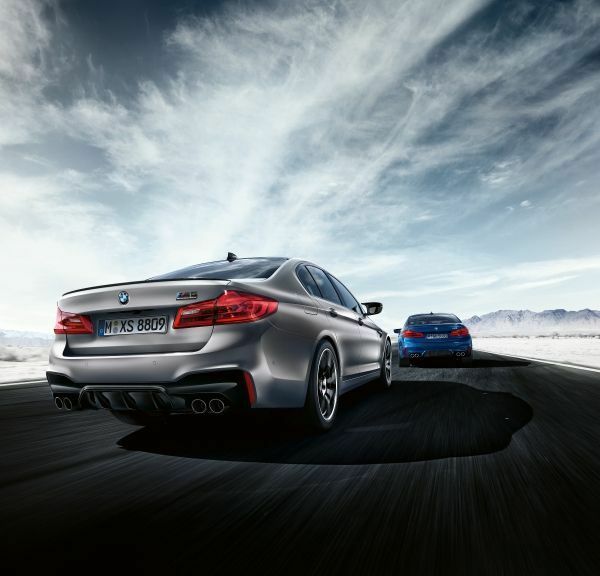 Added to which, the new BMW M5 Competition supplements M Dynamic Mode with three driving programs honed for use on the track: 4WD, 4WD Sport and2WD, which switches to pure rear-wheel drive and deactivates the Dynamic Stability Control (DSC). - Chassis technology meticulously adapted to the engine’s performance profile ensures precisely controllable on-limit handling. Model-specific features of the chassis include a seven-millimetre drop in ride height, special damper hydraulics and stiffer springs, an increased camber at the front axle and modified toe links and anti-roll bars at the rear. Standard specification for the new BMW M5 Competition also comprises exclusive 20-inch forged M light-alloy wheels with mixed-size tyres. - Eye-catching design cues emphasise the exclusivity of the new BMW M5 Competition. BMW Individual high-gloss Shadow Line trim is complemented by the use of high-gloss black for the kidney grille surround, decorative grating of the signature BMW M gills, rear spoiler and exterior mirror caps. “Competition” lettering is added to the likewise black “M5” badge on the boot lid. 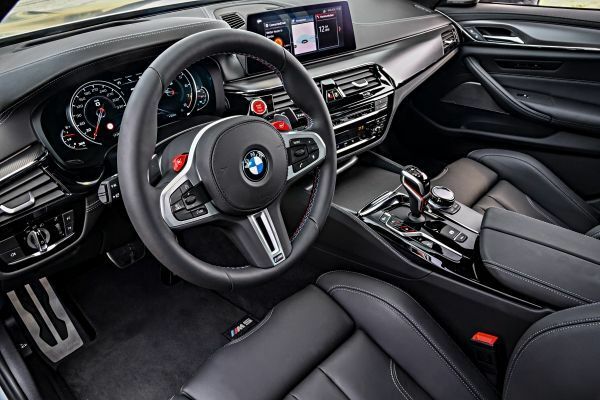 - Black seatbelts with an understated stripe design in BMW M GmbH colours and model-specific floor mats bring a distinctive flavour to the interior of the new BMW M5 Competition. An “M Competition” graphic appears in the instrument cluster when it is starting up. The fuel consumption, CO2 emissions and electric power consumption figures were determined according to the European Regulation (EC) 715/2007 in the version applicable. The figures refer to a vehicle with basic configuration in Germany. The range shown considers the different sizes of the selected wheels/tyres and the selected items of optional equipment, and may vary during configuration. The values for the vehicles marked * are already based on the new WLTP test cycle and have been translated back into NEDC-equivalent values in order to ensure comparability between the vehicles. With respect to these vehicles, for vehicle-related taxes or other duties based (at least inter alia) on CO2 emissions, the CO2 values may differ from the values stated here (depending on national legislation). Further information on official fuel consumption figures and specific CO2 emission values of new passenger cars is included in the following guideline: 'Leitfaden über den Kraftstoffverbrauch, die CO2-Emissionen und den Stromverbrauch neuer Personenkraftwagen' (Guideline for fuel consumption, CO2 emissions and electric power consumption of new passenger cars), which can be obtained free of charge from all dealerships and at https://www.dat.de/en/offers/publications/guideline-for-fuel-consumption.html.